Mobile device has brought much convenience to our daily life, among which Android smartphones have played a critical role for us. But there are times when we need to share data or media files and other important information from Android devices to other platforms, such as Windows, Mac as well as Smart TV and so on. Due to business, educational or entertainment and many other different purposes, the need for screen mirroring on Android OS has been increasing rapidly day by day. Therefore, here I would like to share several feasible tools that can help you stream Android screen without difficulty. 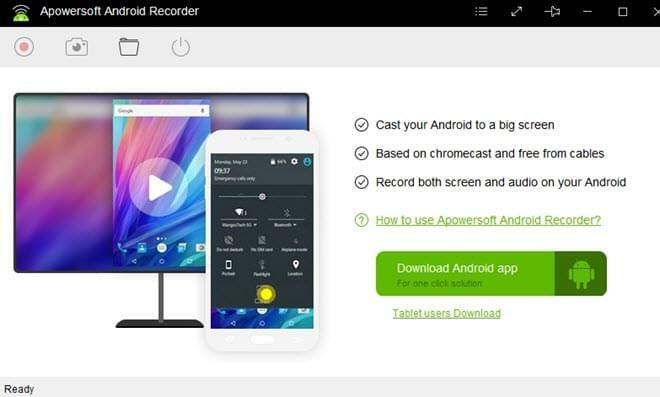 Among all programs, Apowersoft Android Recorder is considered as a powerful program to stream all contents from Android portable devices and transmit them to Windows and Mac PC in the meantime. Adopting the wireless casting technology, it enables users to mirror Android screen to computer without using any cables. Moreover, the internal sound track can also be synchronized clearly. With that feature, a lot of activities like commercial presentations, tutorial demos as well as video game clips now can be easily done and reach better visual effect. Aside from its primary screencast feature, users are able to record Android screen and take screenshot in HD quality for further use. Numerous video formats and even GIF are supported for choosing. Screenshots will be saved as PNG files by default. 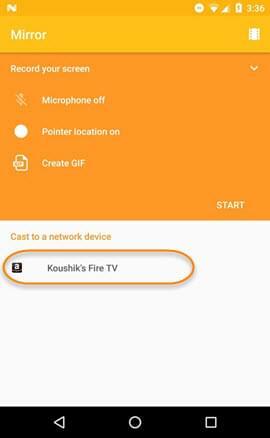 It can be used together with the built-in Chromecast feature or Google Cast app. Under the same network environment, your Android phone and computer can connect with each other. Now, it is compatible with Android 5.0 and later versions. But I try it with my Nexus of Android 4.4, it also works well. Pros: Easy to access, safe and clean, wireless connection, extra screen capturing features, etc. Cons: Does not support for Linux system and Smart TV. Another app that can make screen mirroring for Android is Mirror, still in beta mode so I call it Mirror Beta like many other users do. It is a very simple tool which enables you to transmit your Android screen activity to other devices including Fire TV, Apple TV, Chrome and many more. Android Lollipop users can take it to stream their screen and capture videos. 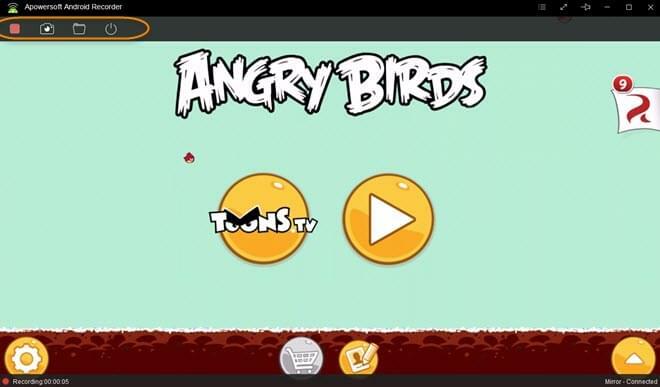 And lower version users may root your devices to access the tool from Google Play Store. Currently, it only supports displaying video from Android smartphones and user needs to install All Cast Receiver app before using it, which needs a little time to master. Another downside is that video will contain watermarks during recording and there is no way to remove it. Pros: Easy to access, wireless connection, video capturing feature, etc. Cons: Does not support for Windows and Mac, root requirement for Android versions before 5.0, only video streaming without audio, watermarks included. 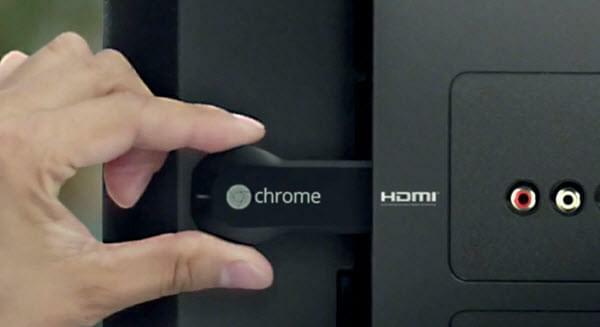 To many users who would like to get some mirroring gadgets, Google Chromecast surely is a nice one. With this tool, you are capable of sharing the screen of a smartphone or a tablet which runs Android or iOS, or a computer with Chrome browser installed, and casting the screen to a Smart TV via HDMI and stable Wi-Fi network. That also means you can choose what video to watch or what music to hear directly on your phone instead of using a remote control there. Both video and audio track can be synced to TV with a larger screen via broadband Internet and Wi-Fi. This offers great features for users to watch apps such as YouTube, HBO, Netflix as well as music from Spotify and more. Now that it has updated and published the 2nd generation product, and the new version of Chromecast is compatible with 5GHz wireless network, whilst the performance shall be much better and satisfactory in every aspect. Pros: Easy to take, wireless connection, multiple devices supported. Cons: Need other accessories if there is no strong Wi-Fi signal. The last program that can serve as an Android screen mirroring tool is ApowerMirror. It’s compatible with both Windows and Mac computer. 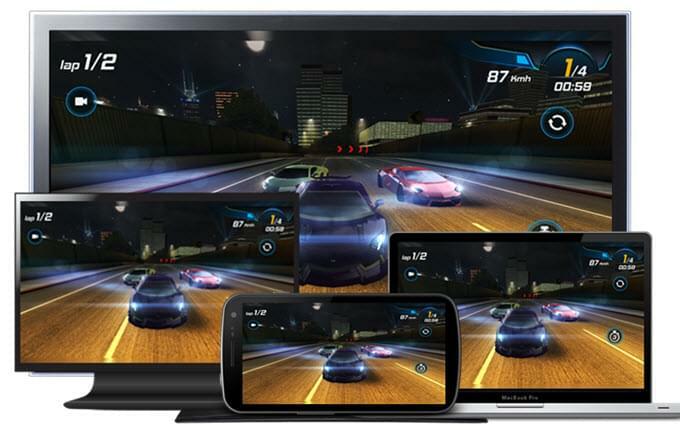 Any screen activities including gameplay, video clips, photos can be mirrored to computer in real time. 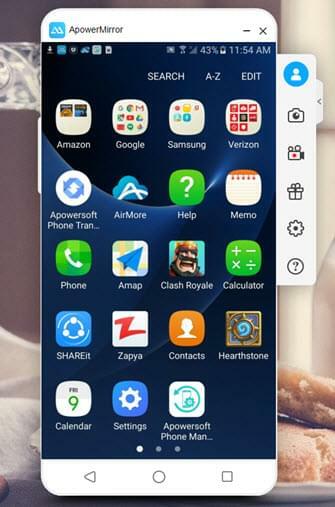 Another upside of this application is that it allows for taking complete control of your Android devices’ screen on desktop, which indicates that you are able to play games, access apps and send messages without picking your devices. Simply download the program from below and use it. After that, you can enable USB debugging and use USB cable to connect your device to PC. Then you may get the Android version installed in phone automatically. Or you can manually download it from Google Play Store and connect via WiFi. In this way, Android screen can be cast to Windows/Mac. Bear in mind that if you desire to mirror screen with audio on desktop, you need to connect via your device’s built-in cast function or the cast ability provided by Google Home. Pros: support mirroring and control Android, provides additional screen recording and screenshot making functions. Cons: does not support for mirroring to TV. Those mentioned above are all viable tools for screen mirroring for Android devices. Each streamer has its own features and defects, so users can choose one according to their own needs.